In 1822 a French Physicist named Augustin Fresnel invented a lens that would make his name commonplace along the seacoasts of Europe and North America. It looked like a giant glass beehive, with a light at the center. The lens could be as tall as twelve feet, with concentric rings of glass prisms above and below to bend the light into a narrow beam. At the center the lens was shaped like a magnifying glass, so the concentrated beam was even more powerful. 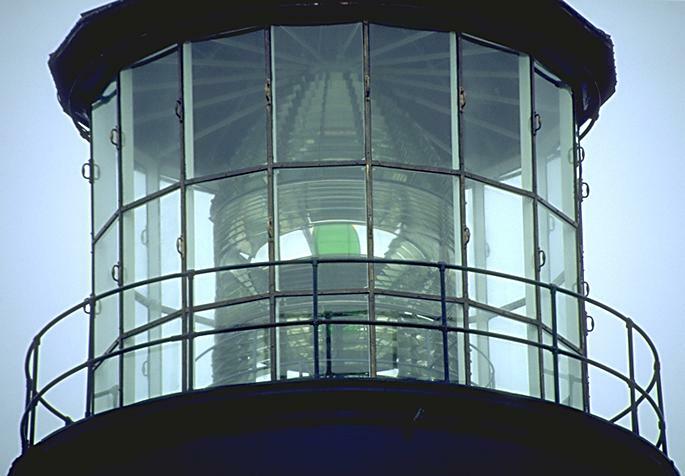 Tests showed that while an open flame lost nearly 97% of its light, and a flame with reflectors behind it still lost 83% of its light, the fresnel lens was able to capture all but 17% of its light. 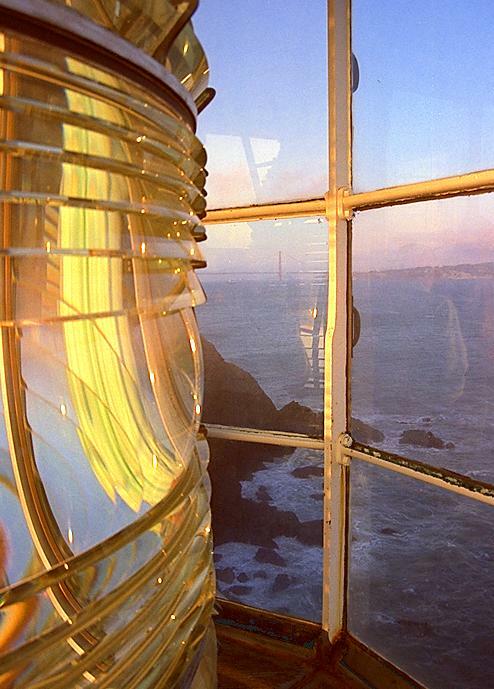 Because of its amazing efficiency, a fresnel lens could easily throw its light 20 or more miles to the horizon. 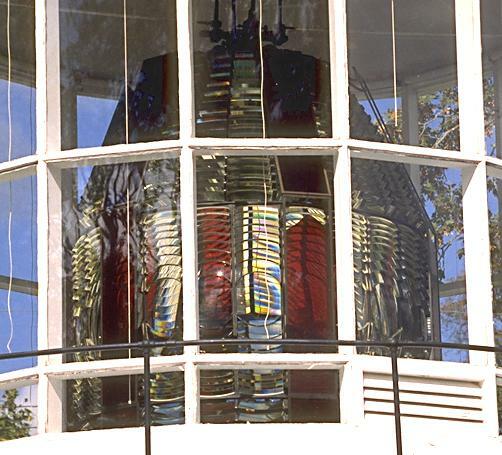 Note the enormous "bulls-eyes" in the original Cape Canaveral first-order lens, which is on display at Ponce Inlet, Florida. The bulls-eyes bend the light into a round beam to create a flashing effect. This is an example of a plain first-order (non-flashing) lens. This one has an unusual green color. This lens still operates at the Southeast Light on Block Island, Rhode Island. Seven types, called "orders," of the lens were developed. The first three largest orders were for seacoast lights, while orders four through six were smaller, for harbor or bay lights. There was also a 3.5 order lens which was used mostly in the Great Lakes. 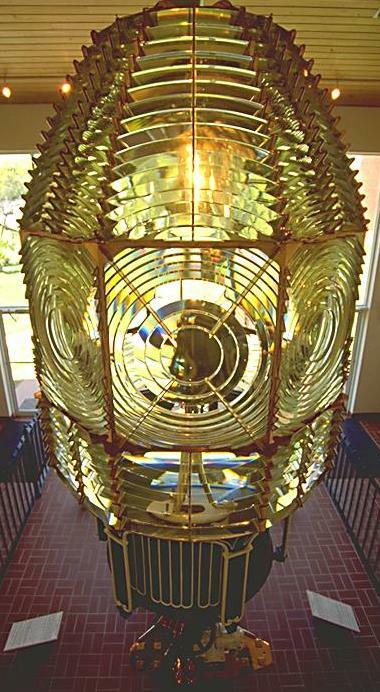 This is the original first-order fresnel lens from the Gay Head Light. It shows two modifications used to create a flashing effect. First, the lens is formed into round "bull's eyes" which bend the light into a beam rather than a flat sheet. Second, the red panels cause a red flash as the huge lens assembly rotates. In Europe the new lenses were quickly adopted, but the head of the U.S. Lighthouse Board, Stephen Pleasonton, strongly resisted, feeling that it was a fad. It was not until the 1850's that most U.S. lights were converted. This is the first-order lens at Point Bonita, California. The plain curved surface of the lens indicates a constant light. Click on this picture to get the full impact of the 155k photo, which clearly shows the Golden Gate Bridge in the background.